The UO Board of Trustees on Thursday accepted a gift of real estate from the city of Eugene for a downtown building that will house the Eugene-area site of the Regional Accelerator & Innovation Network and other innovation activities. RAIN is a state and local partnership of governments, higher education, the business community and entrepreneurs designed to advance formation and growth of regional tech-based startups. RAIN Eugene — a partnership of the university, the Eugene Area Chamber of Commerce and local government — operates the RAIN Eugene accelerator and associated RAIN Eugene programs. The vote by the Board of Trustees, which is required by university policy, paves the way for the transfer of a building at 942 Olive St. to the UO. On Feb. 9, the Eugene City Council voted to transfer ownership of the city-owned building to the university for the nominal sum of $1. Located adjacent to the downtown campus of Lane Community College and currently occupied by Bradford’s Home Entertainment Center, the building will provide 12,800 square feet of flexible space for training, education and support for entrepreneurs from the university and the community. Envisioned as an entrepreneurial hub, the building will house UO activities that support commercialization of university-based or university-assisted research. These include the Tyler Invention Greenhouse — a program sponsored by the Alice C. Tyler Perpetual Trust — and the UO Department of Product Design’s Downtown Innovation Launch Lab. The RAIN Eugene accelerator is an intensive 12-week program focusing on mentored support of the three most important components of a new business; people, product and plan. The Tyler Invention Greenhouse builds on the UO’s strengths in green chemistry and green nanoscience and encourages green product ideas stemming from basic research discoveries. The Downtown Innovation Launch Lab is a set of design studios and services connecting the UO’s expertise and students in product design with entrepreneurs inside and outside the university. The city of Eugene and the UO are already engaged in innovation activities through RAIN. RAIN Eugene is currently housed in a temporary space in the Eugene Area Chamber of Commerce. The move to the downtown core will further strengthen ties between the city and the UO, advance the formation of new companies in the south Willamette Valley and benefit downtown and the city’s overall economy, said city council members who approved the transfer. The timeline for renovating and occupying the new building allows RAIN and the UO access to the building as early as April 6. 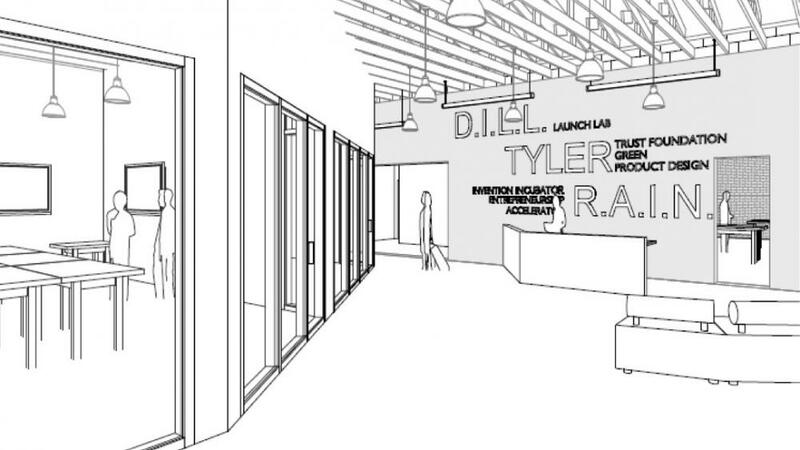 Renovations, including seismic upgrades, will continue through February 2016, when RAIN will occupy the building, followed by the Tyler Invention Greenhouse and the Product Design lab. Renovation costs will be offset through state bonds, the Alice C. Tyler Perpetual Trust, university resources and/or philanthropy. The building will be operated by the university through the Office of the Vice President for Research & Innovation.